The Thrifty Garde Robe: Here I am! Thanks for doing this, and I'm glad to see such a strong response. I'm pretty much a constant thriftshopper--it's cheap entertainment with my kids, and it's how I get raw materials for my art purses, so I can justify it (kinda). Recently one of our local shops had a ton of yarn, including a big bag of vintage Italian mohair--all "tangerine"--for $1.99. 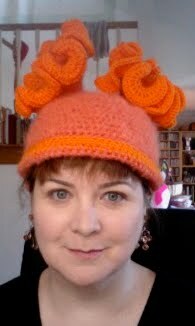 This hat was made from some of that, and from a skein of even brighter orange acrylic yarn I found at a yard sale. I've been wanting to play with hyperbolic crochet more, so.... I think this will be the start of my Halloween costume -- I'm planning another crocheted creation, like last year's garden, but this year I'm thinking "wearable coral reef." Stay tuned. Oh my god! i've just put two and two together and realised you are the purse lady and the crochet pink ear thingos. You are one clever lady!! love love love the garden creation! cant wait to see what you come up with next. I've got to give that hyperbolic crochet a try. It looks so cool. I've seen some really amazing free-form work in both knitting and crochet and have done a little of it, but not recently. It looks like coral or a sea anemone. I love that sort of thing, and I love the color as well.